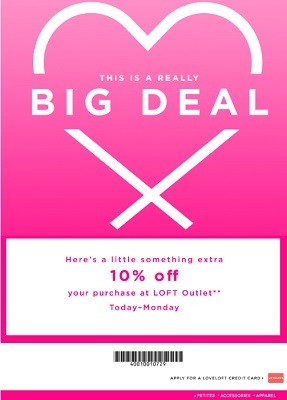 Enjoy long weekend savings at U.S. LOFT Outlet Store Locations. Prices already reduced up to 70% off original prices. Plus, save even more with printable coupon. This printable coupon gives you the chance to take an extra 10% off your entire purchase. This offer is applicable with printable coupon, show the coupon to cashier during the checkout. Offer is valid until January 23, 2017. For more details see any U.S. LOFT Outlet Store Location or U.S. LOFT online. (total: 774)G.H. Bass & Co.